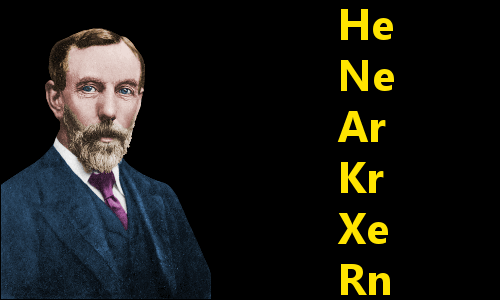 William Ramsay’s discoveries added an entirely new family of chemical elements to the periodic table – the noble gases. He predicted the existence of this family of gases and either discovered or was first to isolate every member of the group. He created the world’s very first neon light when he activated an electric switch to investigate one of the new gases. Ramsay was awarded the 1904 Nobel Prize in Chemistry for his work. William Ramsay was born on October 2, 1852 in Glasgow, Scotland, UK. His father was William Ramsay, a civil engineer. His mother was Catherine Robertson, a governess. Both parents were nearly forty when William was born, and he was their only child. William’s parents were kindly and well-educated, with prosperous middle-class backgrounds. His father’s family had been in the dye business for seven generations. William’s grandfather founded Glasgow’s Chemical Society, and William’s uncle was the geologist Sir Andrew Ramsay. His mother’s family had been physicians for several generations. In 1858, age 5, William began at Mr. Stark’s Preparatory School. William enjoyed building things with toy bricks, sailing toy boats, listening to music, and reading. He liked Hans Christian Anderson’s stories, and books by R. M. Ballantyne, whose most famous work, The Coral Island, detailed the adventures of three boys shipwrecked alone on an island in the South Pacific. William loved animals, especially dogs. With patience and kindness he trained his family’s dogs to an unusually high level. People noticed he tended to live in his own world, often missing things that were happening in school classes. His parents attended a Calvinist church on Sundays, and William sat with them. William read the Bible intently during the sermons, usually in French or German, improving his grasp of these languages in addition to delving into the Bible. In about 1863, age 10, William began attending Glasgow Academy. He was two years younger than the other boys in his classes. He was taught a typical classical curriculum, with heavy emphasis on Latin. He taught himself enough chemistry to make fireworks. William matriculated at the University of Glasgow in October 1866, age 14. He followed a general Arts classical curriculum of Latin, Greek, Logic, and Mathematics. In his spare time, he and his lifelong friend Henry Fyfe, a chemistry student, carried out chemistry experiments. 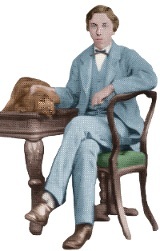 William Ramsay in 1870, age 18, with Doran, one of his family’s dogs. In May 1869, William completed his junior course and immediately began learning about chemistry in the university’s laboratories. In October, when lectures resumed, he took the chemistry courses and a course in natural philosophy (physics) given by the great Lord Kelvin. He completed his science degree in 1871, age 18, then headed to Germany to carry out postgraduate research in the laboratories of the eminent chemist Wilhelm Fittig at the University of Tübingen. In August 1872, age 19, William Ramsay was awarded a Ph.D. for his thesis Investigations in the Toluic and Nitrotoluic Acids. Now we shall fast forward in time to 1887. In that year, age 35, Ramsay became Chair of Chemistry at University College London (UCL), where he was studying nitrogen oxides. On April 19, 1894, he attended a lecture about nitrogen by the renowned physicist John William Strutt (better known as Lord Rayleigh). Rayleigh presented a puzzle to his audience. He had discovered that nitrogen in air was invariably 0.5 percent denser than nitrogen sourced from nitrogen compounds. How could that be? After the lecture, Ramsay asked Rayleigh’s permission to investigate the problem. Rayleigh said yes, and the scientists agreed to stay in touch. In August 1894, Ramsay removed the known components from a sample of air – oxygen, carbon dioxide, and nitrogen. After doing this, he realized there was another gas present with one-eightieth of the original volume. He studied the gas using spectroscopy – a method of ‘fingerprinting’ chemicals – and discovered the gas’s spectrum matched no known gas. The line spectrum of Argon. This ‘fingerprint’ was a key part of Ramsay’s evidence that he had isolated a new chemical element. Rayleigh and Ramsay wrote a joint paper in 1895, notifying the world of their discovery of, on ‘the balance of evidence,’ a new chemical element. They named it argon, from the Greek ‘argos’ meaning inactive or lazy, because Ramsay found it would not chemically react with anything. Other scientists disputed Rayleigh and Ramsay’s work – for example Dmitri Mendeleev, creator of the periodic table, claimed argon was actually triatomic nitrogen, N3. However, the spectroscopic evidence plus Ramsay’s specific heat measurements indicating argon consisted of single atoms persuaded the scientific community that argon was an element. The first evidence of helium’s existence came in August 1868, when Pierre Janssen observed an eclipse using a spectroscope to study prominences in the sun’s corona. In his spectra, Janssen observed a yellow line similar to lines in sodium’s spectrum. Norman Lockyer studied this new yellow line and speculated that it could be caused by a new element. In the following years, the existence of helium – named for the Greek sun god Helios – was debated, but scientists could not agree about its status. In 1895, the year after he and Rayleigh discovered Argon, Ramsay read a paper by William Hillebrand describing how by adding acid to a uranium mineral he had released an unreactive gas, which he believed to be nitrogen. Ramsay wondered if the gas might actually be argon, and he decided to find out. He repeated Hillebrand’s experiment and collected the gas. Spectroscopy revealed the gas was neither nitrogen nor argon. Its spectrum contained a line belonging to no known earthly substance. This line and others present in the spectrum had, however, been seen in the sun’s spectrum. Did this mean the gas released from the uranium mineral was actually helium? Ramsay told Norman Lockyer how he had released helium from rock and asked Lockyer if he would like to repeat it and confirm it, which Lockyer did. Janssen and Lockyer can be said to have discovered helium on the sun, although they could never prove it was a new element. Ramsay’s work provided the proof and produced the world’s first samples of it. In 1896, Ramsay predicted the existence of a new group in the periodic table. In a paper entitled Gases of the Atmosphere, he showed the halogen group, containing elements such as fluorine, chlorine and bromine, with a new group to the right of it containing helium, argon, and other gases yet to be discovered. We need to bear in mind that much less was known about elements in those days. A large number of scientists continued to deny the very existence of atoms. Ramsay’s interpretations of the periodic table were hampered by the fact he was working with atomic weights, because Henry Moseley’s discovery of atomic numbers as the true basis of the periodic table lay almost two decades in the future. Despite the difficulties he faced, Ramsay’s prediction was correct. With helium and argon added to the periodic table, Ramsay sought to fill the gap he had identified between these two elements. In 1896, he enticed a 24-year-old postgraduate chemist by the name of Morris Travers to stay at UCL. Travers had been Ramsay’s assistant since 1894, and had been planning to spend two years in Germany. He found it impossible to resist continuing with Ramsay, who offered him every chemist’s dream – the prospect of discovering a new element. In 1897, Ramsay gave a lecture about his search for new elements to the British Association for the Advancement of Science in Toronto, Canada. Ramsay decided to travel the path that had taken him to helium; he began by investigating minerals to see if he could liberate the new gas. He even obtained samples of meteorites to try to extract the new noble gas. He found nothing. In June 1898, Ramsay changed tack. A calculation of escape velocities of atoms from the earth indicated the gas he was hunting for should be held by Earth’s gravity and not escape into space like helium. Was it possible, he asked himself, that when he discovered argon, he had missed other noble gases lurking in air at lower concentrations? Ramsay and Travers froze a sample of argon, lowered the pressure on it, and allowed it to evaporate slowly, collecting only the first gas that evaporated. High voltage applied to neon in a vacuum tube, similar to the wondrous spectacle seen by Ramsay and Travers in June 1898. Ramsay and Travers discovered krypton before they discovered neon. While they were practicing the experimental procedures for their neon study, they evaporated about 1 liter of liquid air until just 100 ml of liquid remained. Ramsay was looking for neon – a lighter gas than argon. However, the intriguing idea came to him that a heavier noble gas might also be present in air. If so, it must be present in the 100 ml of remaining liquid. Travers evaporated this further to leave 10 ml of liquid, from which he removed the oxygen and nitrogen. He took a sample of the remaining gas in a vacuum tube and, on May 31, 1898, applied a high voltage to measure the gas’s spectrum. As expected, the spectrum showed argon was there, but, excitingly, two brilliant lines which had never been seen before were also there – one yellow and one green. In July 1898, following further fractionation of air, Travers obtained a sample of a new gas that glowed blue in the discharge tube. Its spectrum and further tests established it was the heaviest noble gas discovered so far. High voltage applied to xenon in a vacuum tube. Unlike the other noble gases, radon is radioactive. It is released by the radioactive decay of thorium, and its effects were observed between 1899 and 1901 by Ernest Rutherford, Marie Curie, and Friedrich Dorn. In 1902, Rutherford proved thorium releases a radioactive gas. He and Frederick Soddy deduced the gas belonged to the noble gas family. It was in 1910 that a sample of the gas was finally collected and its density and atomic weight measured. This was achieved by Ramsay and his colleague Robert Whytlaw-Gray. Ramsay and Whytlaw-Gray established that radon is indeed a noble gas. Much more recently, in December 2015, the new element oganesson was added to the noble gas group of the periodic table. Only a small number of atoms of oganesson have been made, and scientists cannot be sure if its chemical behavior will be consistent with the other elements in the group. In fact, theoretical calculations suggest it will be chemically rather active, and therefore not a true noble gas. In 1903, Ramsay and Soddy discovered that the radioactive decay of radium produces helium, a significant step in establishing the science of nuclear physics, and proof of Ernest Rutherford’s hypothesis that a connection exists between helium and radioactivity. In 1872, after completing his Ph.D. in Germany, Ramsay returned to the UK and his hometown of Glasgow, where, age 20, he became an assistant in the chemistry department of Anderson College (now Strathclyde University). Here he worked mainly in the field of organic chemistry. Seven years later, he was appointed Professor of Chemistry at University College, Bristol, where he worked for eight years, becoming one of the most eminent physical chemists in Europe. In 1886, Ramsay, age 34, had a troublesome polyp removed from his right nostril – the first hint of a medical issue that would eventually prove fatal. Further polyps appeared in the following years and surgeons removed them. In 1887, Ramsay became Chair of Chemistry at University College London (UCL), where he quickly changed the rules to allow female students into the same classes as males – previously they had been taught separately. Ramsay featured in the magazine Vanity Fair in 1908. In 1881, while at Bristol, Ramsay married Margaret Buchanan, who also came from Glasgow. They had a daughter and a son: Elizabeth and William George. Ramsay and his family enjoyed traveling; they spent a lot of time in North America and Europe. Ramsay and his wife traveled to India in the winter of 1900-1901 at the suggestion of J. N. Tata, to help advise on the location of the new Indian Institute of Science, often called the Tata Institute. He also loved learning languages and was fluent in Latin, Greek, German and French. He made a point of learning to speak at a basic level the language of the countries he visited – so he picked up some Norse and Hindi for example. Ramsey was active and fit: he enjoyed playing tennis, walking, boating, and climbing. His favorite literature was Walter Scott’s Waverley Novels, which include Rob Roy, and Ivanhoe. In 1902, he was knighted, becoming Sir William Ramsay. In 1912, age 60, Ramsay retired from his chair at UCL to live in a large home and estate close to the town of Hazlemere, about 30 miles (50 km) from the center of London. He converted the estate’s stables into a laboratory. William Ramsay died, age 63, of nasal cancer in High Wycombe, England, UK, on July 23, 1916. He was survived by his wife and their two children. He was buried in the Holy Trinity Churchyard in Hazlemere. "William Ramsay." Famous Scientists. famousscientists.org. 19 Dec. 2016. Web.